Work of art on view at Nada Motel. RENO.- While some artists complain about the gallery system, artists in Reno NV are doing something about it. Thats why Chad Sorg and a handful of other artists decided that they could do it themselves, showing their work in motel rooms at a residence hotel and a motel in downtown Reno. 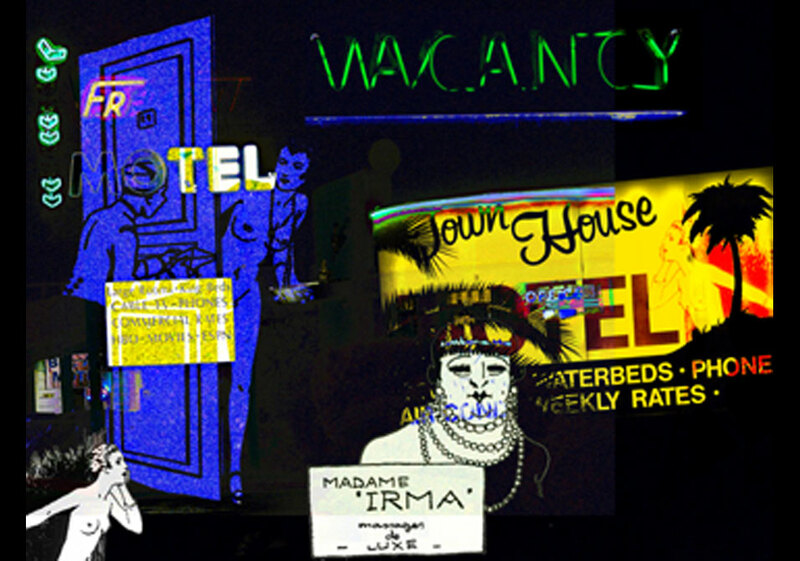 This exercise in DIY exhibitions was called Nada Motel and ran from June 26th to the 29th at the El Cortez Hotel and the Town House Motor Lodge. This is the 2nd year Reno artists have strutted their stuff during the last weekend of June. Last year the venture was called Dada Motel. Sorg says you can expect the name to change each year. This year, more artists participated, including Sacramento artist Ann Tracy who acted as a Sacramento goodwill ambassador by bringing along art by Cherie Hacker and modern-tribal jewelry by Cynthia Burdick. While most of the work was traditional in that it was painting, mixed media, sculpture, there was some digital fine art and installation work there. Most memorable were the digital photomontages by Ann Tracy based on photos of old motels and naughty French line drawings, Dean Burtons photo series called the Architecture of Electronica, Jerry Tarners sculpture and several installations. Also notable were Patty Meltons color renderings of historic Reno Motels, Paula Povilaitos rubbings of water and sewer caps and Cindy Guns sculptural piece Mockery of a Mosque. The installations included one called The Barn by Ned Peterson and Kai Prescher where they took plastic to cover the room and then built a small barn area, complete with straw on the floor and a TV for the ducks to watch. Maybe you had to be there. Mark your calendar for Yada Motel next year on the final weekend of June in Reno. For more information, contact coordinator Sorg at chadsorg@gmail.com.